For my birthday I received my first ever Coho-read! There have passed a lot of books by this author on my dash on Goodreads but I never got to buying one but then I received one from my parents (thanks again!). 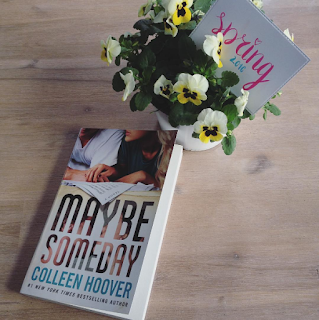 I wanted to read it instantly but was reading other books and had to wait until now... Let me present you: Maybe Someday by Colleen Hoover. And can I also already say that this book... was amazing? Because damn, it really was! Sydney lives the life. She studies what she wants, she has an amazing best friend and a very hot boyfriend. For short: she's living a perfect life where she can be who she wants to be and do what she wants to do. Yet things change when Sydney finds certain things out. Things weren't as right as she thought they were and it took Ridge to point it out. Ridge is one of her neighbors that plays amazing music but currently is in a writers block. It took him months to get something on paper and finally the day had arrived. Because of Sydney he could start writing again and also together they make fantastic music. He helps her out, she helps him out. That's how it works and it creates a beautiful friendship... where soon the lines become blurry. This book was one of the best books I've read in a while. Maybe because I haven't read in a while. I'm sure you've noticed that I'm not around a lot on the blog but it's the end of the school year! I need to study a lot, probably just as you guys. So forgive me that I haven't posted a lot lately but I'll make up for it soon! Back to business! Maybe we should start with how I thought about the characters. First of Sydney. She's amazing. This character is so full of emotions and full of life that it's impossible not to connect with her. She has her ups and downs but that's the same in real life and Colleen Hoover made it so realistic with this character. First she had a good time in her life but it takes Ridge to point out the flaws. And that's the moment you really see what can happen in those moments. Sydney does break down and feels lonely but soon picks up her life again. The strength in this character is so inspirational. It's not the only time we'll see her strength. That's the thing I loved most about Sydney. She's also not the girl that lets herself being played. Not when she knows something is wrong. She does go find the problem and she handles it. Another thing where we can learn from her. Although she often had some moments of weaknesses she always fought against it and I adored that in her. She's also one of those understanding characters that would rather spare people from all the suffering she's been through. And believe me she has had a lot of obstacles through her life. 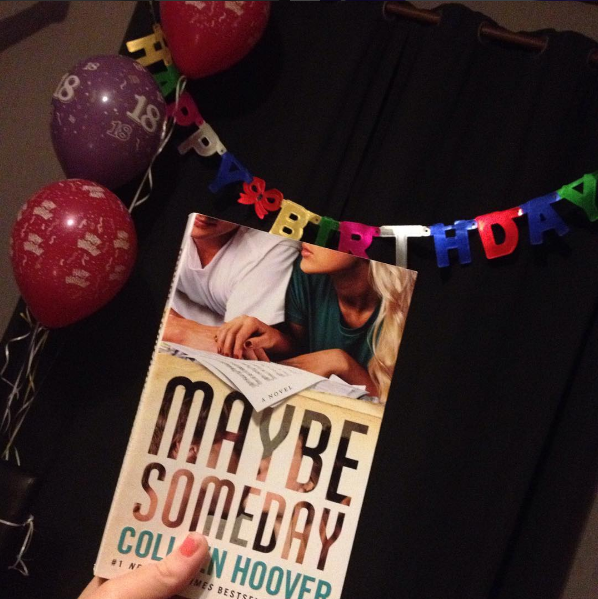 Colleen Hoover really portrays this and those are also the things that drew me to this character. As for Ridge. He also grabbed my attention! Believe me he's not the boy you expected him to be in the first few moments you get to read. He's special and it took me a while to understand. It was as if we were in Sydney's head, finding it out at the same moment. One thing I really appreciated with Ridge was his honesty. He was brutal at times and I often felt the heartbreak other characters have had to endure but his honesty does play to his credit. He's also one of the emotional guys in this book and that's another side of him that I could really appreciate. Of course there are many more characters that I would want to discuss but if I could only choose one I'd say Warren. The first few times we get in contact in him I was a little doubtful about him. This character does change a lot in this book, he grows to be more mature than he was in the beginning and he also understands, on a whole different level than Sydney does. He's more the observer and then gives his point of view and I did find myself adoring this character. Warren is special, I give him that! Next to all the things I've already said about him, he's also an amazing friend. There's nothing he wouldn't do for Ridge, Sydney, Maggie and Bridgette. Because of this I often felt like he'd put aside everything and even himself so he could help out his friends or make them happy again. I find that this has also caused me to become crazy about Warren. Yet if it's too much for him, it's too much and he'll tell you. If you like it or not. Special type but such an amazing character, that's how I'd describe Warren in one sentence. Those are really the characters I wanted to discuss but I also want to point out the bond between Sydney and Ridge for a few minutes. What I adored about these too was that they fulfilled each other. One was understanding, the other was honesty. They could be open towards each other, something that really caught my attention in the book. It's amazing to see how they can grow so close only by being open to each other, telling what needs to be told. If there'd be one thing I could pick out of the book, then it was this bond. Their truest emotions were just thrown on the table whether the other did or didn't want to know them. Absolutely breathtaking! These characters were so realistic and you had a character that reflected a person of real life. There was the understanding one, the mature one, the observer, the person who's always brutally honest, the tough chick, the soft one, the betrayer. It was all there, presented on a golden tray. And each of them had so many different emotions of different times which caused a mass of emotions that tugged at your heart from the start. Secondly, some more of the plot. Maybe it's a good idea to already tell you guys that it's a book with double point of view. I'm a big fan of books like that because I love a peek in each head. The plot was also very capturing, with that I mean that it didn't leave me untouched. Colleen Hoover presents you such a reliable book that's so close to the aspects of real life. Maybe Someday contains things that are happening right now, somewhere in the world. It contains so many emotions because of all the things that happen. It's not only the "wow, I found a new friend and I'm happy. ", no! Sydney has had a hard time because of things that happened. Also Ridge is suffering! Even the other characters, because we do get a glimpse in their life too. It's not only the suffering that counts it's also all the possibilities to get out of the suffering, the holding on to old things from the past, the giving up. It's everything there could, and probably is, out there in the real world. And it doesn't only talk about the current affaires, no we also get a glimpse in their pasts! Things they found hard and we'll see how they have dealt with it, which was a great asset too. I can truly say that this book, my first ever CoHo-read, was absolutely fantastic. It has a realistic perspective, it doesn't only discuss the current affaires in the characters lives but also the ones from the past, it'll give you amazing and realistic characters which you absolutely can relate to. Above that the plot will grab you and will not let you go, you'll go through so many feelings, so many you maybe need a timeout because you can't do it anymore (that's what I had). You're going to want to throw the book out of the window only to go downstairs and grab it again to know what's going to happen. And if that's not enough then I don't know what will convince you! This is an amazing, emotional, heart throbbing, breathtaking book and is worth all five starts I've given it.